Everyone who used WINDOWS is must have come across the error that claims, “Cannot delete file: It is being used by another program”, while trying to delete, rename or move a file. When a file is being used by another application, or Windows native services, it gets locked by the operating system so that it can’t be modified by the user. Its really irritating when you are doing important work. But don't worry! A simple, lite weight tool called "UNLOCKER" is really one click solution. It can delete, move and rename files that are being used by other applications. Just RIGHT-CLICK (Read how to Edit Right-Click Menu) on file and Unlock it. Its that simple. 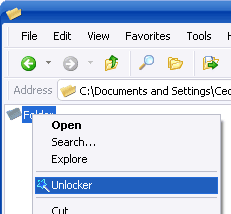 If the folder or file is locked, a window listing of lockers will appear, you have to just click Unlock. So simple. So Fast.